Lewis B. Ripley married Caroline Elizabeth Hood, daughter of Samuel Blair Hood and Sarah Jane Miller. Lewis B. Ripley was born in 1844. Leonora Hood was born in September 1865 at Spring Green, Sauk, Wisonsin. She was the daughter of Sergeant Joseph M. Hood and Mary Ann Seiders. Leonora Hood died in August 1866 at Spring Green, Sauk, Wisconsin. James W. Webber married Marcia E. Hood, daughter of Sergeant Joseph M. Hood and Mary Ann Seiders. James W. Webber was born in 1866. Nelson Harris Scott married Eliza Jane Hood, daughter of Sergeant Joseph M. Hood and Mary Ann Seiders. Nelson Harris Scott was born in April 1862 at New York. He died on 10 June 1945 at Wyoming at age 83. He was buried after 10 June 1945 at Greenhill Cemetery, Laramie, Albany, Wyoming. Name Variation Eva M. Dickson was also known as Dickinson. Married Name Her married name was Hood. Eva M. Dickson married Dr. Thomas Henry Hood, son of Sergeant Joseph M. Hood and Mary Ann Seiders. Eva M. Dickson was born on 18 December 1866 at Canada. She died on 14 June 1943 at Texas at age 76. John Hopkins married Helen E. Runyan, daughter of Lillian Ione Hood. John Hopkins was born on 18 February 1908 at Wisconsin. He died in March 1981 at Sauk, Wisconsin, at age 73. Hazel Runyan was born in 1910. She was the daughter of Harry Arthur Runyan and Lillian Ione Hood. Hazel Runyan died in 1996. Harry J. Runyan was born on 8 March 1913. He was the son of Harry Arthur Runyan and Lillian Ione Hood. Harry J. Runyan died on 30 October 1969 at age 56. (?) Harris married Dorothy Alice Runyan, daughter of Harry Arthur Runyan and Lillian Ione Hood. Jay F. Warner married Edna Dora Runyan, daughter of Harry Arthur Runyan and Lillian Ione Hood. Jay F. Warner was born on 29 November 1892. He died on 18 November 1967 at age 74. William H. Gulker married Elizabeth (?). William H. Gulker died after 1950. Married Name Her married name was Gulker. Elizabeth (?) married William H. Gulker. Elizabeth (?) died before 1950. James R. McEvilly was born on 29 March 1916 at Iowa. He married Jessie Louise Hutter, daughter of Clarence George Hutter and Mildred Buchner, on 8 January 1949. James R. McEvilly died on 27 April 2006 at Wisconsin at age 90. Married Name Her married name was Seiders. Phyllis Tennis married Reginald William Seiders, son of Joseph Harry Seiders and Orphia Jane Culver. Phyllis Tennis was born on 12 November 1908. She died on 25 June 2001 at age 92. She was buried after 25 June 2001 at Seiders Burial Ground, Jefferson, West Virginia. John Joseph Burns married Helen Cornelia Baer, daughter of Henry Clay Baer and Elizabeth Matilda Schambaugh, on 14 November 1899. John Joseph Burns died on 7 January 1926. Kenneth Leroy Burns was born on 22 May 1902 at Wisconsin. He was the son of John Joseph Burns and Helen Cornelia Baer. Kenneth Leroy Burns died on 7 October 1989 at age 87. Name Variation Bernice Margaret Burns was also known as Berniece H.
Married Name Her married name was DeRidder. Bernice Margaret Burns married Christian DeRidder. Bernice Margaret Burns was born on 9 May 1905 at Wisconsin. She was the daughter of John Joseph Burns and Helen Cornelia Baer. Name Variation Christian DeRidder was also known as Chris. Christian DeRidder married Bernice Margaret Burns, daughter of John Joseph Burns and Helen Cornelia Baer. Cecil J. Burns was born on 15 March 1914 at Wisconsin. Cecil J. Burns died on 2 June 1999 at age 85. Married Name before 1930 As of before 1930,her married name was Nesland. Married Name 16 August 1951 As of 16 August 1951,her married name was Newman. Letha Inez Burns was born on 13 September 1907 at Wisconsin. Letha Inez Burns married Thomas Nesland before 1930. Letha Inez Burns married J. Earl Newman on 16 August 1951 at Waukesha, Wisconsin. Letha Inez Burns died after 1982. Name Variation J. Earl Newman was also known as Earl Newman. J. Earl Newman was born on 21 February 1897 at Essex, Canada. 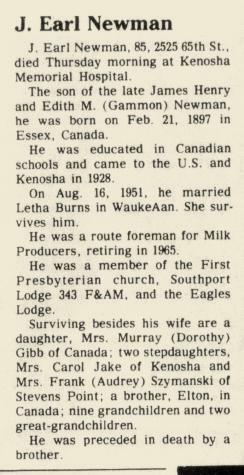 He married Letha Inez Burns, daughter of John Joseph Burns and Helen Cornelia Baer, on 16 August 1951 at Waukesha, Wisconsin. J. Earl Newman died in April 1982 at age 85 J Earl Newman obituary. Married Name Her married name was Gerlach. Elizabeth Mae Burns married Walter Gerlach. Elizabeth Mae Burns was born on 4 November 1910 at Wisconsin. Elizabeth Mae Burns died on 13 December 2003 at age 93. Walter Gerlach married Elizabeth Mae Burns, daughter of John Joseph Burns and Helen Cornelia Baer. Thomas Nesland married Letha Inez Burns, daughter of John Joseph Burns and Helen Cornelia Baer, before 1930. Married Name 1 September 1951 As of 1 September 1951,her married name was Szymanski. Audrey Helen Nesland was born on 3 November 1930. She was the daughter of Thomas Nesland and Letha Inez Burns. Audrey Helen Nesland married Frank Szymanski on 1 September 1951. Audrey Helen Nesland died on 29 October 2003 at age 72 Audrey H. Szymanski, 72, Silver Lake, passed Oct. 29, 2003, at her residence. Services Monday at the Piasecki-Althaus Funeral Home in Kenosha. Mass of Christian burial at St. Peter Catholic Church in Kenosha. Interment in Sunset Ridge Memorial Park. 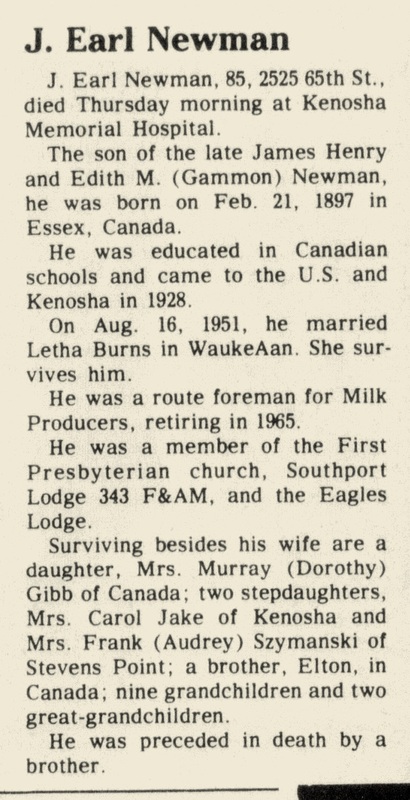 Born Nov. 3, 1930, in Kenosha, daughter of Thomas and Letha I. (Burns) Nesland. Married Frank J. Szymanski on Sept. 1, 1951, in St. Casimir Catholic Church, Hull. Employed as an elementary school secretary at Bannach Elementary in Stevens Point, retiring in 1997. A member of St. Peter Catholic Church in Kenosha and had been a member of St. Peter Catholic Church in Stevens Point. Survivors include her husband, Silver Lake; two sons, Thomas F., Fargo, ND, and John P., Atlanta; one daughter, Linda M. (Paula Skedsvold) Szymanski, Washington, DC; and one sister, Carol Jake, of Kenosha. Frank Szymanski was born before 1933. He married Audrey Helen Nesland, daughter of Thomas Nesland and Letha Inez Burns, on 1 September 1951. E. E. Aldinger died after 1909. S. F. Hall married Olive Corina Baer, daughter of George Gilbert Nickey Baer and Catherine Zintz, before 1931. In June 1931 George N and Catherine (Zintz) Baer 56th wedding anniversary celebration. Marvin L. Fingerhut was born on 11 May 1927. 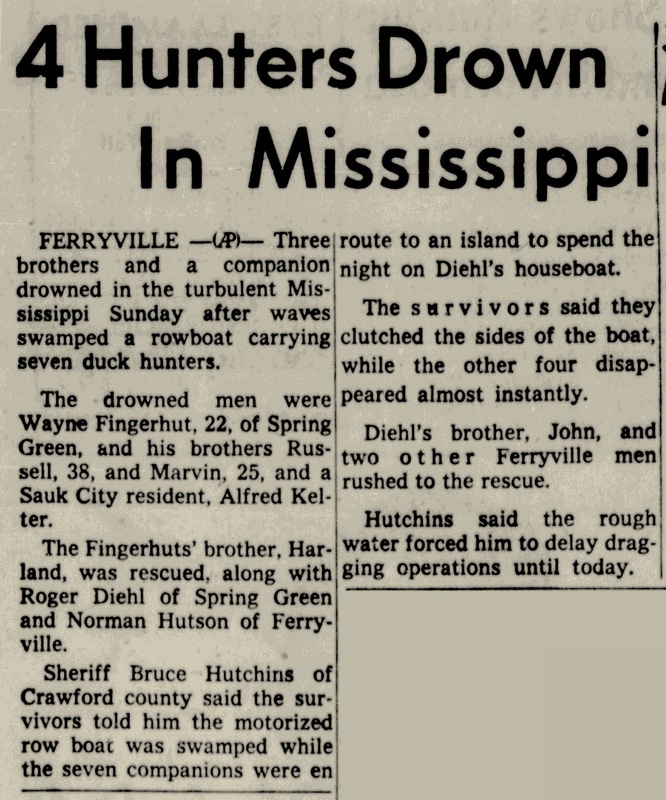 Marvin L. Fingerhut died on 23 October 1955 at age 28 Siblings Wayne, Russell and Marvin Fingerhut drown while duck hunting. Wayne Fingerhut was born on 7 January 1933. 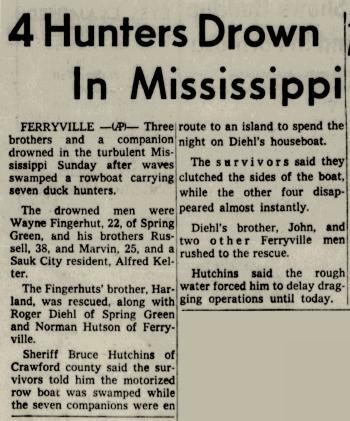 Wayne Fingerhut died on 23 October 1955 at age 22 Siblings Wayne, Russell and Marvin Fingerhut drown while duck hunting.